By now, David Sedaris is practically a household name, at least in the blue states. He regular appears on public radio, especially on the wonderful show This American Life. He has wisely given up writing pieces that are blatantly fictional, and now writes about himself, his boyfriend or his family in pieces that probably have a grain of truth. His writing is often very funny, because he highlights the absurdity of life, especially his life and that of his apparently bizarre family. This collection of his latest stories is good as his previous work, although his preoccupations have moved on to include the squabbles with his boyfriend and the reactions of his family to his writing about them, and one of the best pieces is a powerful meditation on being a gay man being friendly to a boy in a culture which still tends to equate homosexuality with pedophilia. The funniest moments in Dress Your Family concern his brother Paul. In his reading of his stories, which is by far the best way to become acquainted with Sedaris, he gives his brother a redneck accent and makes him sound ridiculous. But then, from the start of his career, one of Sedaris' strengths has been his ability to combine startling cruelty about other people with a deep sympathy for them. Presumably his acerbic wit derives from his own self-hate, so we can only hope that he never develops healthy self-esteem or we will be robbed of one of most distinctive comic voices of the modern world. One of the problems for comic writers is that their perspectives become familiar, and by now most of Sedaris' readers know what to expect from him. This is not necessarily a barrier to commercial success: some comics seem to be able to go on from year to year with very little change in their routine. On the other hand, it does become harder to remain original and some readers and listeners stop laughing so hard. I have to admit that for most of this audiobook, I didn't get to a guffaw, and stayed at the level of amused smile. 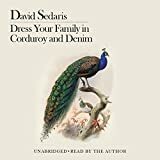 Sedaris' performance is more powerful in front of a live audience, and the two pieces in this audiobook that are from live shows here are especially strong. It's easier to be carried along by the audience's laughs than listening to Sedaris' more pristine recording studio readings. It also seems that Sedaris may have written enough about his family, and it could be time to give them a rest and move onto other subjects. Nevertheless, Dress Your Family is both moving and very funny. Sedaris' performance of his own work emphasizes his slightly warped view of the world, and this unabridged reading of his book is definitely entertaining. Recommended.